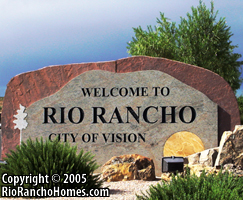 Rio Rancho, New Mexico, the City of Vision, is the third largest and fastest growing city in the state of New Mexico. The 73 square miles of Rio Rancho rests at approximately 5,300 feet above sea level. Located North of Albuquerque, Rio Rancho increased its independence as the city's infrastructure grew rapidly in the early to mid 1990s. Presently, the city's latest project has been the new downtown center which includes a new city hall building that opened in 2007. Originally part of the 89,000 acre Alameda Land Grant given by King Philip IV of Spain in 1710 to Francisco Montes Vigil, the City of Rio Rancho was born in the early 1960s when an investment corporation purchased 55,000 of those acres, then referred to as Rio Rancho Estates. In 1980, Rio Rancho's population was at 9,985. Ten years later, the city's population grew by over 225% to 32,551. By 2000, the city had increased its size by another 59% to 51,765. Today, the population has climbed to over 87,000. The Rio Rancho school system consists of 1 preschool, 10 elementary schools, 4 middle schools and 4 full/alternative high schools. The latest high school, Sue Cleveland, opened in 2009. 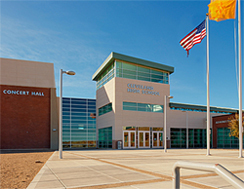 Most recent, CNM Community College expended into Rio Rancho in 2010. The facility has 34,304 square feet of classroom space, 14,660 square feet of lab space, and a student services center. UNM West also opened doors to students in early 2010 with a phase 1 building of 42,000 square feet. The campus is expected to welcome as much as 10,000 students. The City of Rio Rancho offers a variety of employment opportunities through its broad retail establishments as well as the city's three largest employers: Intel Corporation, Rio Rancho Public Schools and HP.